1. After driving approximately 7~10 km (4~6 miles or about 10 min), stop at a safety location. 2. Connect the filling hose (2) of the compressor directly to the tire valve. 3. Plug the compressor power cord into the vehicle power outlet. 4. 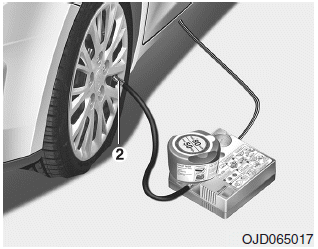 Adjust the tire inflation pressure to the recomended tire inflation. With the ignition swithched on, proceed as follows. Use of the TMK may be ineffectual for tire damage larger than approximately 4 mm (0.16 in). We recommend that you contact an authorized Kia dealer if the tire cannot be made roadworthy with the Tire Mobility Kit. The tire inflation pressure must be at least 220 kPa (32 psi). If it is not, do not continue driving. Call for road side service or towing. The sealant on the tire pressure sensor and wheel should be removed when you replace the tire with a new one and inspect the tire pressure sensors at an authorized dealer.